Are you confident that your vehicle can stop at a moment’s notice? Our certified auto mechanics can conduct quick and efficient diagnoses in a cost-effective manner to determine the extent of brake service for major makes of cars, SUV’s and trucks needed to provide the stopping power that is crucial to your safe driving experience. Call or visit Rick’s Tire and Chevron for an inspection by our ASE® certified auto mechanic that specializes in brake maintenance and service. Driving your car, SUV or truck with worn-out brake pads or rotors can be very dangerous because both conditions increase the amount of time required to stop after the application of brakes. Because your vehicle’s brake system is the single most important safety component we offer a free, no obligation inspection using high-tech equipment to ensure its operational safety. 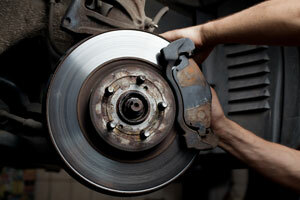 If you need to have major components replaced, we can provide a brake replacement cost. Postponement of service when your brakes need to be replaced will likely result in higher costs because replacing hydraulic parts is expensive. Call to schedule a complimentary inspection, change or repair by an ASE® certified mechanic. If your warning light is flashing, or the warning indicator attached to the brake pad is making whistling noises, squealing, grinding or chirping sounds, it may be time for auto brake repair or possible brake replacement. The life of brakes varies so we strongly encourage paying close attention to the built-in indicators and to take advantage of our complimentary inspection.